I would make a bent laminated drawer front. like Bondo said – - – - are you going to bend and laminate the apron ? make the drawer front from the same veneer to match the apron grain pattern. Another approach to fitting a curved front drawer within a bent lamination apron would be to start by building the drawer box. 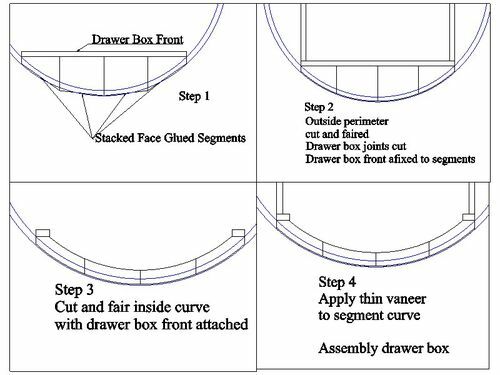 Before gluing the drawer box together, glue the drawer box front to a face-to-face laminated stack which offers a flat side to the inside of the drawer. Inside and outside curves matching the table apron diameter can be cut into the laminated stack with the drawer box front applied to the laminated stack. The drawer box can then be glued together, and a veneer front matching the apron applied to the laminated stack. If the diameter of the table is such that it precludes simply stacking one board on another to form the laminated stack, the face-glued stack could be joined in segments. The lumber making up the stack could be either drawer box lumber or lumber from which the table is built. When the inside curve of the stacked lamination is cut, the curve should obviously avoid the drawer box joinery. The major challenge with this method is fairing the inside and outside curves of the drawer front. It may require inside and outside patterns as well as a pattern router bit and a flush trim router bit. This method would avoid the difficulties of fitting a drawer box to a curved drawer front and eliminate any problems associated with spring back. If the bent laminated drawer front was to spring back, it may not match the diameter of the apron.